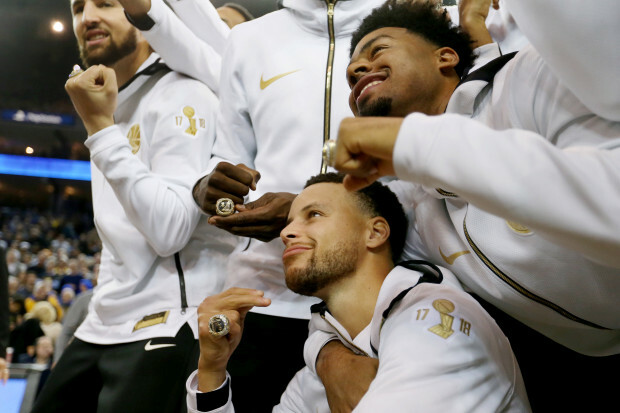 The Golden State Warriors opened the NBA season with a championship ring ceremony for the third time in four years and reminded everyone of their place atop the league’s pecking order Tuesday with a 108-100 victory over the Oklahoma City Thunder at Oracle Arena. Paul George (27 points, five assists and four steals) led a Thunder team playing without Russell Westbrook after he underwent arthroscopic knee surgery, while Stephen Curry (32 points, nine assists and eight rebounds) and Kevin Durant (27 points, eight rebounds and six assists) spearheaded Golden State’s attack. Oklahoma City pulled within two with less than two minutes remaining, but an and-1 from Curry and a late basket from Durant clinched the win. The Thunder weren’t supposed to stay close Tuesday with Westbrook and Andre Roberson sidelined and Steven Adams dealing with a back issue, per Monte Poole of NBC Sports Bay Area. Oklahoma City not only hung with a historically great team without its MVP candidate and premier defender, it quickly erased a double-digit deficit and built a second-half lead. It also hinted at what’s to come when all the pieces of a new-look team playing without Carmelo Anthony’s ball-stopping ways are together. The pieces fit together more smoothly without Anthony, and the wing defense will be much improved with George and Roberson together. George is a three-time All-Defensive selection who can defend the opponent’s best player while carrying the offense, and Roberson was a defensive force in 2017-18. Oklahoma City’s defensive rating was 96.6 when he was on the floor and 108.4 when he was off it, per NBA.com. By comparison, it was 105.6 when Anthony was on it and improved to 102.3 when he was off. Don’t dwell on one shorthanded loss to the league’s best team—the Thunder are primed for an impressive season. It becomes a matter of nitpicking when looking for weaknesses on a team coming off four straight NBA Finals appearances. Golden State even addressed potential frontcourt concerns by adding one of the elite centers in the league in DeMarcus Cousins this offseason. In a perfect world, Golden State will take all that talent and accumulate blowouts throughout the season so it can rest Curry, Durant, Draymond Green, Klay Thompson and Cousins when he returns from his Achilles injury. The Warriors’ best chance at a three-peat is keeping that fivesome fresh before May and June.